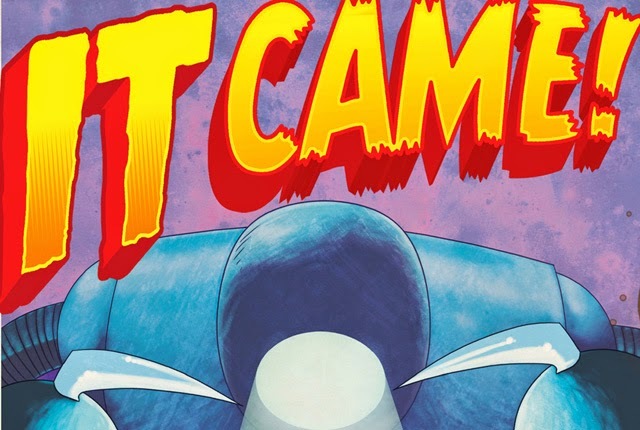 Titan Comics: IT CAME Review #bestbritcomics | Warped Factor - Words in the Key of Geek. Blimey, old bean, says Tony Fyler. Alrighty then. It’s like every black and white British alien invasion B-movie (and one or two much-beloved British sci-fi TV shows to boot), rewritten by the Goons, with a dollop of Carry On and more than a whiff around the edges of The Rocky Horror Picture Show. Alright – in sleepy rural England, there are foul doings afoot. In fact there are foul doing a great big alien metal foot, with everyone from yokels to army officers being picked up and carried off to a big submerged and shiny flying saucer. Dr Boy Brett, square-jawed sexist space boffin and his girl assistant Doris Night are on the scene, trying to buy a decent pickled egg when they fall foul of the metallic monster from beyond the moon, and run about being brave, dense, and very very British about the whole thing, calling in the Army, then calling them in again when the first lot they call in turn out to be very believably drawn and ‘voiced’ Carry On characters who get nabbed while looking for Mint Imperials, or, in typical Carry On style, while in the khazi (translation for Americans: bathroom). What exactly the aliens want is revealed in a very comic way that would be immensely spoilerific, but it’s a very daft, very funny, very Dangermousey plot that unfolds as the aliens stomp their way to London and start making trouble in Marble Arch and Piccadilly. The gift of a very silly, very inventive reason for the aliens to attack allows for an equally silly solution to be absurdly logical and tremendous fun into the bargain. More than anything, it’s the care and attention to detail in It Came! that will appeal to geeks and sell the humour. In this volume, you don’t just get ‘the main feature’ of an alien invasion B-movie – you get the advertisements, you get the trailer for another equally hokey movie, The Lost Land of the Lost, you get an intermission – it all makes for an instant transport to the world the comic-book is satirising, and an immersion in that world. Particularly joyous, the quality of the drawing, which is conspicuously high throughout, takes an intentional dip when, in the Lost Land of the Lost trailer, a giant dinosaur appears on screen, so it contrives to look just as plastic and fake as anything King Kong ever battled, or – Who-fans – anything Jon Pertwee faced. Likewise, in the ‘main feature,’ when the spaceship flies over London, it’s suspended by an entirely visible ‘string.’ Details. Beautiful details. That sort of attention is also present elsewhere – the believably drawn and voiced Carry On crew is an odd little moment of joy for British readers, though whether they’ll translate to other audiences is less certain. At the core though is a very British sense of humour – the storyline feeling Goonish, but the more subtle amalgamation of period sexism and modern judgment on it having a more Victoria Wood, French and Saunders vibe. All in all, It Came! manages to be almost all things to all people – geeks will love it for the laughs it rips from the B-movie genre, and while the storyline and characters here positively quiver with period Britishness, there’s every chance it will appeal to a broader audience, because, for instance, American readers will transpose their own B-movie clichés and characters across. Dan Boultwood plays his references and judges his line of parody excellently well for the most part, leading to over a hundred quickly turned pages that leave the reader waiting for the next instalment of his work, flicking back to particular images or gags that made them laugh, and going on into the rest of their day with a grin that can be rekindled simply by remembering. 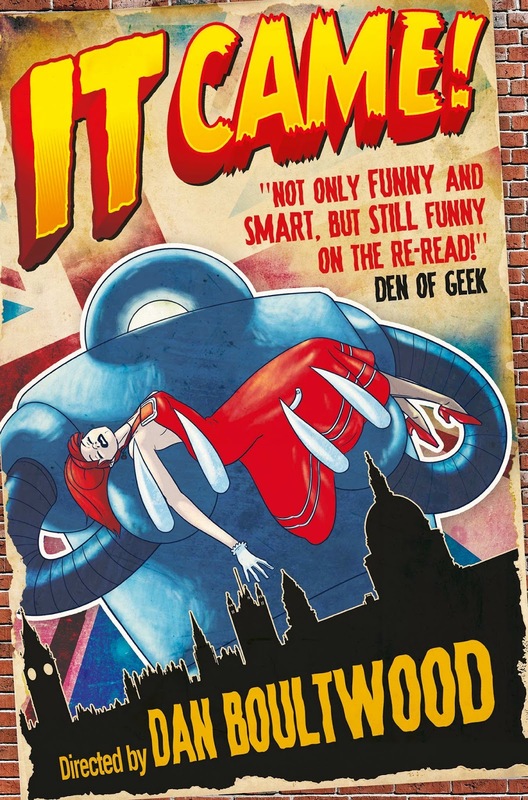 In terms of Titan Comics’ #bestbritcomics promotion, Boultwood is certainly a name to look for, with superb artwork and a great line in British parody of a science-fiction institution.